This WINK Audiobook is a fable of a nine year old boy being raised by his carpenter father who is sick and tired. Every day for the last 20 years the carpenter has visited the Well of Wealth and spent a dollar, believing that if he gives generously to the Well, it will give generously to him in return. On this day, the Carpenter is so unwell he is unable to visit the well, so he sends his nine year old son, Richard, in his place. Richard is entrusted with a treasured crumpled dollar, and sets off on his journey to the Well of Wealth. Following an overgrown path, Richard discovers that the Well of Wealth is not where or what he thought it was. On the journey Richard meets a host of mysterious and intriguing characters including an old woman, an Optometrist, a Plumber, a Gardener, a Fisherman, a Rower, a Musician, and an Inn Keeper. Each have built their wealth in very different ways, and yet, there is something about them that is common to them all. This fictional tale makes you think deeper as to the dynamics of wealth creation. The keys to wealth are in a story behind a story. To find the keys, you need to become better at seeing as "What you see is always what you get." Each reading will help you to discover more keys, until one by one, they will unlock the doors to your wealth. Roger's book is a wonderful journey of this young man trying to understand what wealth is. Powerful yet simple to understand and leave you intrigued and puzzled enough to read it again and get the dog ears on it :-). WINK is the only book that I have read more than twice. I have read it 5 times so far and each time it reveals to me more about myself. It has helped me think about what work I was doing and what I now will only do. To me it is about making choices in your world. Choices that we all have the ability to make though often are too scared to make. I recommend you do not lend this book to anyone, you will refer to it yourself too often!!! With the clarity and innocence of a small child, this book creates a new world of possibilities to open our eyes and move forward, dare to do something slightly different, to produce a great difference. "The world is waiting. Anticipating..." Fantastic job Roger! 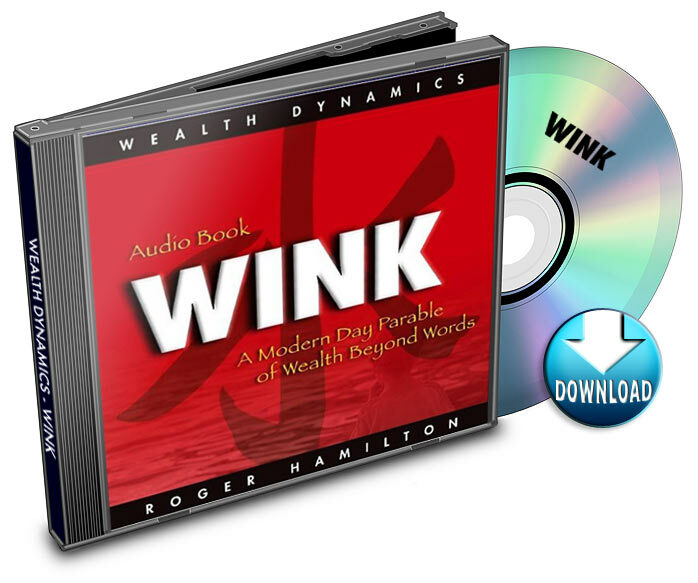 Roger Hamilton's WINK is easy and fun to read - packed with a lot of wisdom you wish you'd known earlier. But tell yourself it is never too late! This is an excellent little parable, some would call it a bath read, sit in the bath read it then ponder what you have just learnt, then read it again. I was so impressed with the book that I brought 20 copies and made them available to some of my best clients. This is a must read for anyone serious about getting wealthy. This is a stunning book. It's a wonderful parable of a young man's search for wealth. And like any great parable (and this is certainly that) you go back to it time and time again. On each read there are brand new insights. This book is absolutely 'up there' with the finest 'classic' texts of all time. Click the button below to add the WINK | Audiobook (download) to your wish list.